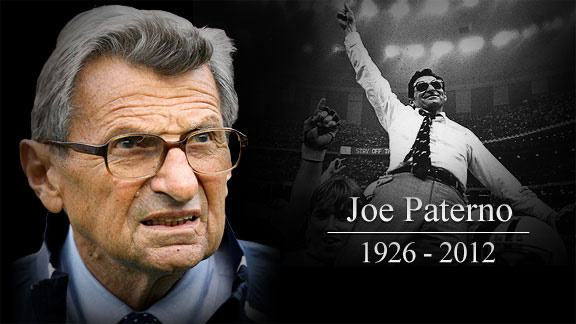 With the death this weekend of my favorite college football coach, Joe Paterno, it caused me to remember my one brush with greatness. I had the honor of personally meeting Joe. I was in my last semester at Penn State, in the summer of 1979. I had just finished my golf class and was walking back from the golf course towards Rec Hall, on the Penn State campus. It was a very quiet, peaceful walk, as the huge campus is very empty during the summer. I heard that Joe’s office was in Rec Hall and I got the crazy idea of stopping by his office. I was going to be graduating in a few weeks, and thought to stop by to see if his staff might have a photo of Joe that I could take with me after I graduate. I found his office in Rec Hall and was greeted by his secretary. I told her I was graduating and moving south for law school in a few weeks. I asked for a photo of Joe and she told me to have a seat. She left to go to a back room, and when she returned, she told me to wait another minute as she could do even better than a simple photo. Soon after, Joe Paterno came up to greet me, and he had a big photo of himself and offered to autograph it for me. He chatted with me for a couple of minutes, asked me where I was planning to go to law school, and signed the photo, wishing me good luck in law school. As a Penn State student, meeting the revered coach, one-on-one in his office, was an amazing experience. That was more than 30 years ago, but I still remember it as if it was yesterday. I join the tens of thousands of former students , athletes and friends in mourning Joe’s passing.